This was very tasty, and does indeed taste like the Ikea ones! I think your potato dices are more likely 1/4″ to 1/2″, NOT 1/8th inch. 1/8th inch is juillenne strips cut up…which turned brown on me. 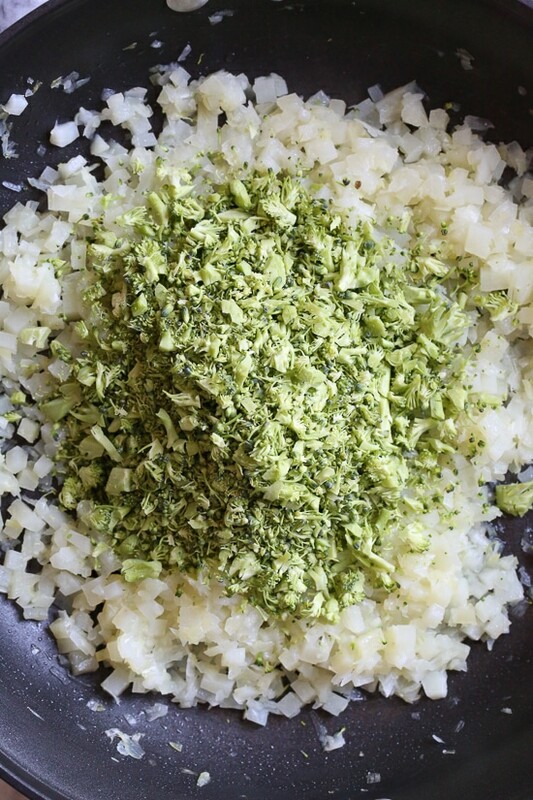 I found another similar recipe where the potatoes were cooked separately in water just like making mashed potatoes, and they were lightly mashed before mixing with the other veggies. I will be trying it out that way. I baked mine in a muffin pan rather than frying, but like many other people, mine fell apart, and they were VERY wet. I’m making them now with some egg whites as a binder, and omitting the water. We’ll see how this goes! Thanks for the yummy sounding recipe! I’m here because I loved the IKEA one and also hosting a book club brunch and getting anxious-can you share what else was in your aunt’s brunch? She obviously has great taste and is practical too :). I can’t recall exactly what else we had this day but you can check out my list of brunch recipes for some ideas! I tried and they were absolutely delicious and easy but I substituted Gruyere and mine never fell apart. They were so good that my 4 & 2 year olds ate them and asked for more while leaving the meat on their plates. I used a nonstick pan to ensure they wouldn’t stick. Thanks for a recipe I have wanted for years! Tried it today. While it tasted alright, it wasn’t amazing or special – it’s ok for meal prep, but definitely not something I would be proud to serve to others. The prep wasn’t long by any means, but given the below average end product, the effort just wasn’t worth it – I’d much rather just mash everything together. This is the first Skinnytaste recipe that I wont be trying again. But having said that, it could also be because this site has amazing high quality recipes. This one just missed hte bar. Could i get the conversion of oz to cup? Taste good but how did you get them to keep shape?! Wish I could post a picture. Mine are…. less than pretty ? Did anyone find a fix for them falling apart? I followed all the instructions and weighted all ingredients, but these completely fell apart in the pan. Can you make this with rices cauliflower instead of potato? Not too sure. If you try it, let me know how it comes out. I made these delicious cakes for dinner last night alongside a pork chop and they were FANTASTIC! I prepped the broccoli and the leeks a day ahead of time and it saved me a lot of prep time after a busy Monday at work. My only downfall was not using a nonstick pan in the initial steps–lesson learned for next time! Thank you, Gina! I’m as big of a fan of Skinnytaste as there is. Own both books and will get the 3rd. This recipe though is a fail. Takes way too long to prepare (why no food processor here?) and they look nothing like any photo above. Tastes just okay. Won’t ever make them again. By far my worst recipe experience here. Tasted great, but the patty spread out and fell apart during browning. It seemed like when the cheese started to melt all heck broke loose and they went the way of a mashed potato. If I try these again, I will try putting them in the fridge like someone else suggested. Also, when I put this into recipe builder it came out to 3 freestyle points. Tripled the recipe and said it served 12. Did not work well with a stainless steel skillet. It still tasted delicious. Will definitely try again but using non-stick! Can I use frozen broccoli? I forgot to buy fresh broccoli ? Can you please provide cup conversions? 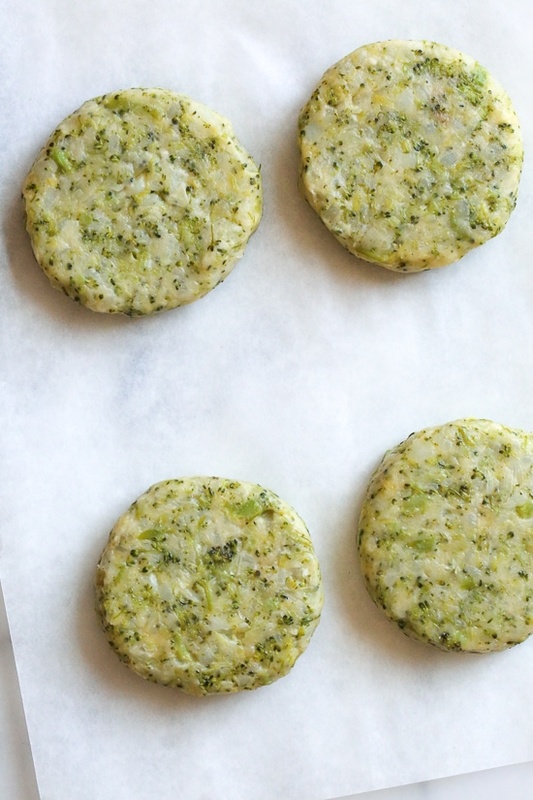 Could you make these with frozen broccoli? I wanted to try making them tonight but forgot to buy fresh broccoli ? 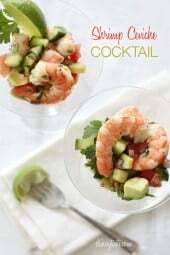 Hi Gina, I love so many of your recipes and got the ingredients to try this one tonight. However, I noticed that it uses ounces instead of cups. Is there anyway that you can add a conversion for the next time I come back to this recipe? I love not only the flavors you put together but how simple they are for me to follow- 2 reasons I keep coming back to you. This one is going to require a little more concentration on my end. Thanks! I made these yesterday and loved the flavor. I had company over and was talking while I cooked so I likely messed up somewhere, but they spread and fell apart a bit when I flipped. I’m thinking I might have put too much cheese? Or maybe I needed to chill the patties a little bit first or perhaps the Pan wasn’t hot enough? I will try again, though, because they were a huge hit even if they weren’t pretty! Tasted very yummy but my patties didn’t fry. They stuck to the pan. Maybe my pan wasn’t hot enough when I put them in? I’ll put the veggies together as a stir fry though. I made these yesterday to have on hand for the week. Used the fresh grated potatoes (Simply Potatoes), as that’s what I had on hand. Heated one up for breakfast this morning, topped it with an egg & a little sliced avocado – it was delicious! I also could not get them to bind up at all. They fell apart in the pan. Hmm, wish I knew why. I made these several times. When I enter these into my tracking on ww with the nutritional info, it comes out as 5 points. Am I missing something? Made these for breakfast this morning. I subbed a delicious herbed gouda from a local dairy for the cojack. They were delicious. My husband liked them too. I topped it with a poached egg, a little habanero aioli and some microgreens. Delish!Like the other posters, they were tricky to bind together, though I did get patties out of them. I like Kate’s idea above to use mashed potatoes. What a great recipe in which to use leftover mashed potatoes! 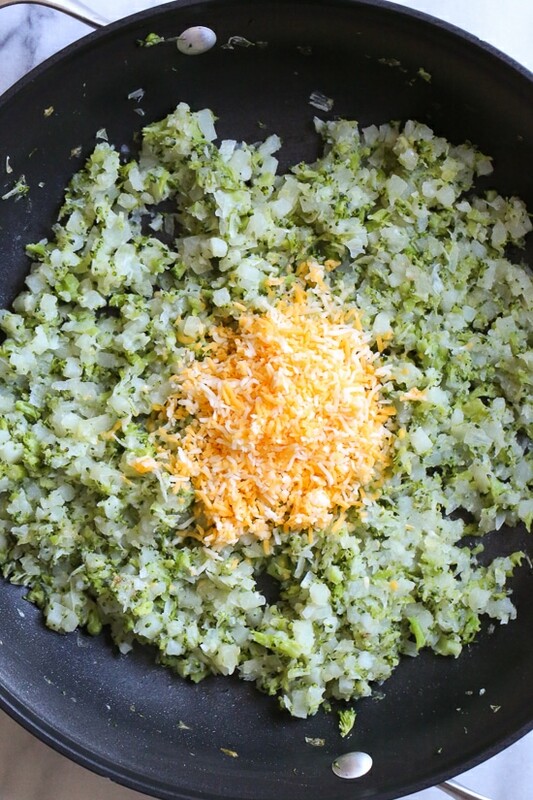 On many of the most recent recipes from SkinnyTaste, I’ve noticed there is not button to “Pin” the recipe. Is this being eliminated intentionally? I love to pin recipes so I can find them when I’m ready to use them and so I can use my iPad in the kitchen as I’m cooking. Weird, if you hover over the photo you don’t see it? I made these tonight, but I couldn’t make them into cakes. They fell apart. So I made them as a hash browns and it was very good, but I’d like to make the cakes. Any suggestions to help with the binding? These came out great, but I must have done something wrong. I added more water than called for, and when it came time to fry them they were just too gooey to fry and flip. I had to cool them for longer and dredged the cakes in flour to get them to bind more. I think the mixture would even be good as a cheese & broccoli mashed potato dish before frying them! Why did you add more water? This looks great- how much oil do I put in the skillet to heat the cakes? I love sneaking a little healthy into dinnertime faves. So smart Gina! 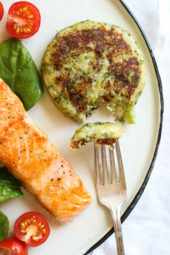 What are your thoughts on using frozen hash browns for the potatoes? I can’t wait to try out this recipe! I did this because I did not want to cut the potatoes and had several bags of frozen hash browns lurking in my freezer. I thawed them out, rinsed, drained and it worked beautifully! I actually made them skinnier than she has there and they were kind of crispy which was a really nice texture. I made these today, and while they were tasty, they didn’t bind together very well for me with the potatoes cooked like this. Next time I will boil and mash the potatoes and add them when the other ingredients are cooked. Great combination of flavours otherwise! Added lots of black pepper and not so much cheese (I ran out, haha! Perhaps the mixture is better with more cheese). The leek gives it a lovely sweet touch. 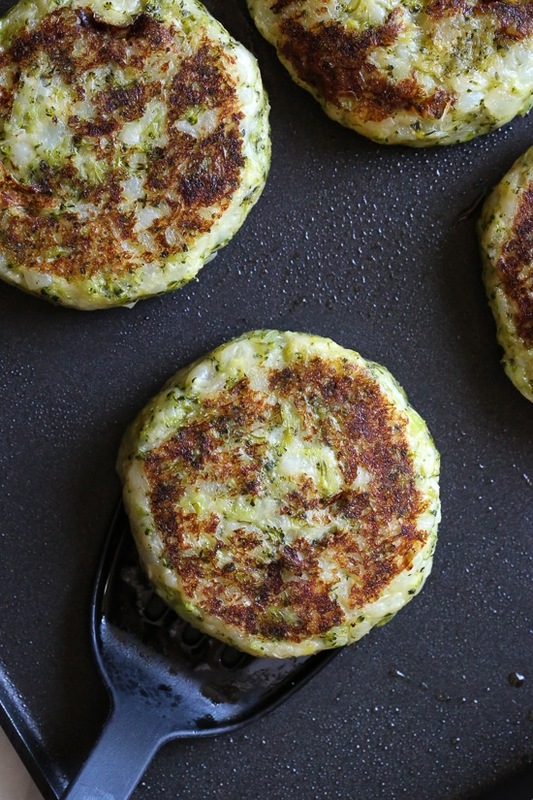 Try forming the patties and placing them in the freezer for an hour first. Once in the pan to cook, try not to flip them more than once, you want to get the carmelized brown bottom that Gina displays in her pictures. I am in the market for a new knife. My current one is dull. You have a knife in one of your pictures. What type of knife do you use? Thanks! that is a santuko knife! great for chopping. Any oil in the pan first? Could you please convert ozs. of veggies to cups. These look so good! Can you make them in the air fryer instead of frying them in a skillet? My husband is doing the keto thing. Do you think the potato could be replaced with cauliflower? 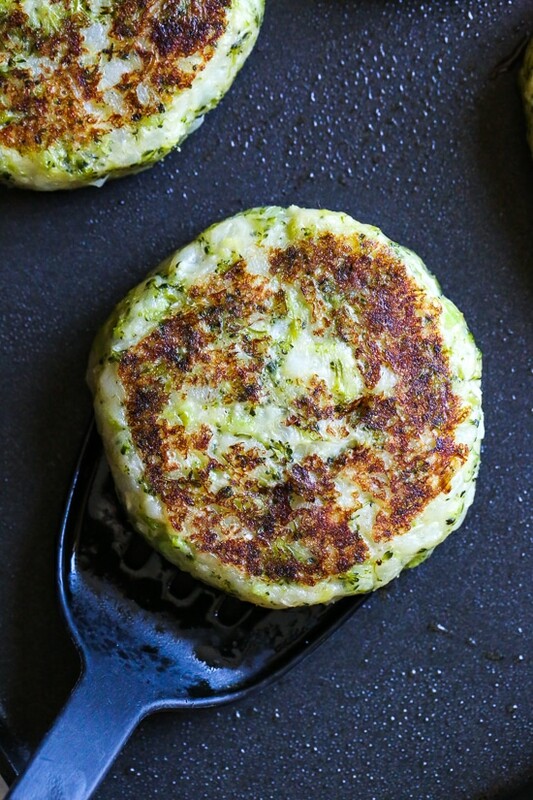 Did you or your hubby try these with cauliflower, if so how did they go? 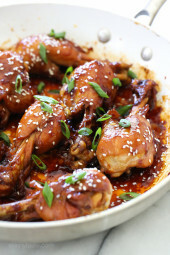 Thank you so much for yet another lightened up recipe. Question: is there any substitute for the leek? I’m not a fan of leeks, yet love onions, shallots, scallions, and garlic. I know I can just leave it out, but don’t want the cakes to lack some vital flavor. TIA Gina… LOVE your recipes and happily own all your books. I would use a mild onion, like Vidalia. I don’t care for leeks either and have been one bunch of green onion plus a little more of the regular onion and a little more garlic. Perfect for my own tastes. Two questions: do you freeze them after you cook them or before? What about grating the potato instead of cubing it? To freeze, flash freeze until firm, then wrap them tight in plastic or foil. To bake from frozen, preheat the oven to 390F, bake frozen 25 minutes. 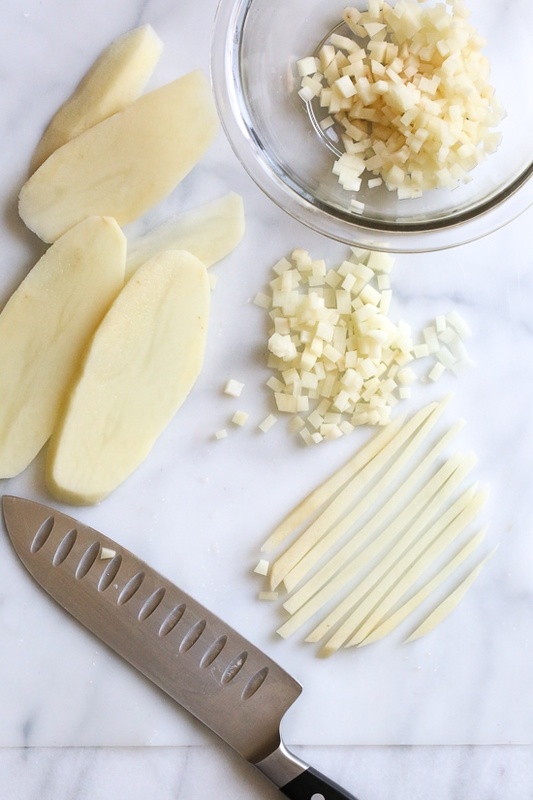 Can you just grate the potatoes? the question from Katie C. was: do you freeze them after you cook them or before? These look delicious! I bet you could make these bite size for appetizers! 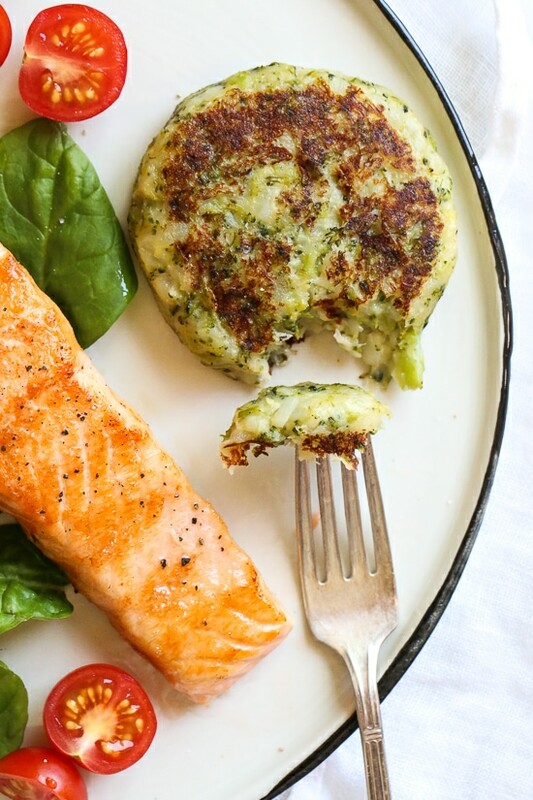 Awesome side dish, we love all variety of veggie cakes! You can change up the ingredients to suit your entree and freezing them is just a bonus. Had to laugh about 390 degrees for reheating…Gina, you are so precise. Thanks for the info about not using a food processor. I did the potatoes with a mandolin and put them in salted water. It was fast and they didn’t turn brown. 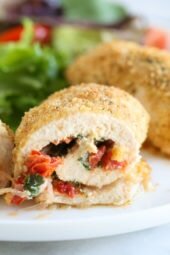 I love that these can be prepped ahead of time and frozen to have on hand, especially for guests! I’m definitely going to make these, they look amazing Gina. After the cakes have been formed, do you need to refrigerate to firm before cooking? I did not, but seems some people are having issues so it’s not a bad idea. Would it work the same if you used riced cauliflower instead of the potato? They sound so good! I was just wondering if there was something to replace the cheese with in order to keep it vegan? Thanks! Diaya cheese would be an excellent choice. I like the cheddar and the smoked Gouda blocks best. It is delicious and vegan. Looks delicious! 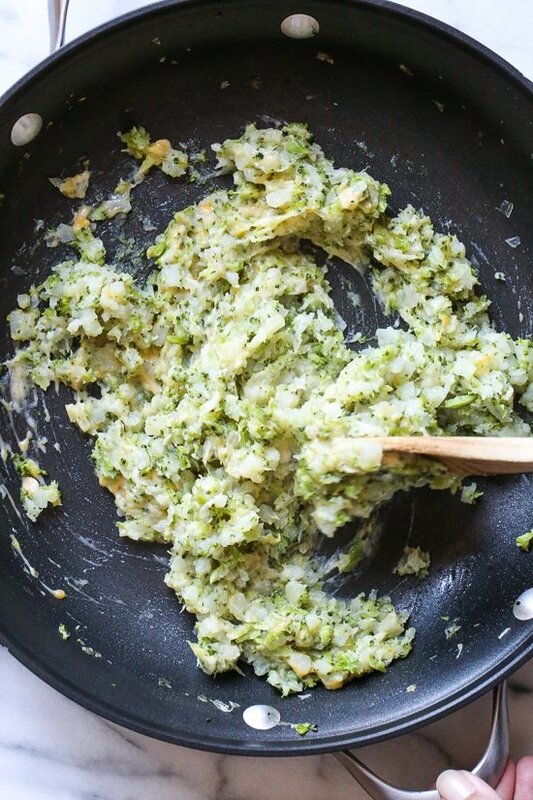 Is the broccoli cooked before you add it to the pan or raw? Yum! Those look great. Going to try for sure! I am so excited to try these! As soon as I saw the pic I instantly thought of the IKEA diner and was so happy to see that is what they were based on. Yummmm! Thank you!